One bullet point, for example, was called "Monkeys Getting High for Science." That sounds fine with us, whatever the context. 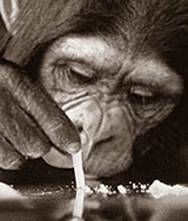 Just straight-up giving monkeys cocaine for fun? Sure! Throw a couple billion more that way, set up back alley monkey cocaine-fighting rings, make some t-shirts, etc.